Have you ever thought about what makes you personally productive? What are the circumstances that help you do your best work? Liam Martin wants to encourage you to define your personal productivity. He believes everyone has their own different measurement for productivity because everyone has different goals. He’s the co-founder of Time Doctor and Staff, services that help organizations gain insights into their team’s activities using artificial intelligence. He has helped thousands of clients measure their productivity over the past five years, providing a ton of fascinating research about what makes people truly productive! 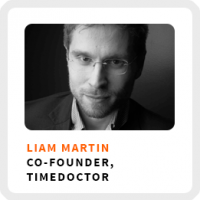 Why Liam believes he has more productive conversations with prospective clients when he doesn’t identify himself to them as the co-founder of his companies. He shares his favorite question he likes to ask when meeting people at conferences to gain insights into what’s really important to them. What attention residue is and why it happens. And he shares why the most productive people actually work less than everyone else. Align your habits with your goals. Core work activities + habits: 1) Checks his dashboards for any problems. 2) Take blocks of time to move the business forward instead of just working in the business. 3) Spend an hour a day just thinking about the business. Ideal work environment: Getting to a separate and specific work space, either at his office – in an old loft, a 5 minute walk from his home with extra monitors – or in his home office. Unproductive habit to change: Being affected psychologically by checking his dashboards. Working to change that by reducing how often he checks them. 1) Use Time Doctor. It can give you the quantitative data to help you start examining the things that affect your productivity. With the 30 day free trial, you get permanent access to your data. 2) Compare your results. If you have team members or colleagues in similar situations, comparing your data can help contextualize what the data is telling you about your productivity.